Easily one of the yummiest salads I have ever tasted. And I've had a few. 3 easy steps - perfect summer salad for BBQ's, but fancy enough for a dinner party. I made the dressing first so that the flavours would incorporate by the time I mixed it through the salad.. In a small bowl mix together - 1 T Olive Oil, 1 T Mirin/Sake/Rice Wine, 1 t Chilli, 1 T Tamari/Soy Sauce, Juice of 1 Lime and a handful of Chopped Mint. Chill in the fridge until later. 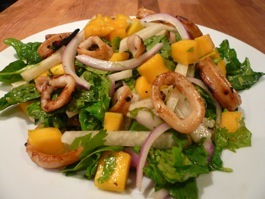 In a large salad bowl add chopped Mango, Avocado, Red Onion, Spinach Leaves and Cashews. Coat Calamari in Egg and then Almond Flour. Fry in pan. Add to salad bowl and mix chilled dressing through. The Mint gives this salad a vibrant and refreshing taste, and the contrasting textures of the cashews and avocado make this salad insanely perfect. If you aren't a fan of seafood then Grilled Chicken would work well too. Hope you all love it as much as I did!